The Industrial Welfare Commission (IWC) Wage Order #13 Industries Preparing Agricultural Products for Market, on the Farm is a general labor law poster poster by the California Department Of Industrial Relations. This poster is mandatory for some employers, including employers in the industries preparing agricultural products for market, on the farm. This poster, written in Spanish, must be posted in a conspicuous place where all Spanish speaking employees will see it for any Industries preparing agricultural products for market and on the farm employers. This poster describes the standards and laws that must be followed in the Industries preparing agricultural products for market and on the farm. It appears you don't have a PDF plugin for this browser. 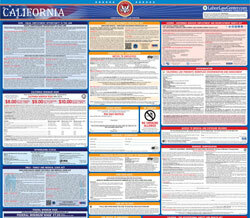 Please see the link below to download california-iwcarticle13.pdf. This  Order Must Be Posted Where Employees  Can Rea d It Easily IWC FORM 1113 (Rev.